It’s a mere five weeks until I hit the road from Beijing to Melbourne. Nerves and excitement are roughly in equal measure at the moment. There’s the little voice in the back of my mind that keeps saying things like “Are you mad? Why on earth did you think this was a good idea?” etc. That’s to be expected. It’s no small thing I’m undertaking and if I wasn’t a little concerned about the scope of it, then I should be locked away in a small, but comfortably appointed, padded cell. I was out for a training ride yesterday – 50km loop up the lake to XiZhou and back again – with the bike loaded with all the kit I’ll be carrying with me for the next year. That’s when the excitement and the sense of adventure caught up with me and I felt that sense of freedom that comes when one is unencumbered with the trappings of modern-day life. 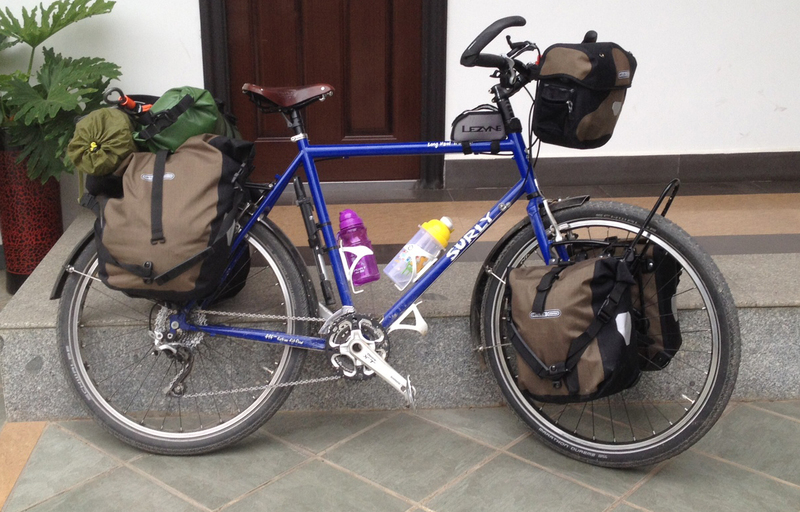 The thought that I had managed to secure all the things that I would need for a year on the road to a bike that I had constructed by myself was almost euphoric. I don’t know how to explain it, but if you’ve experienced something similar – releasing the burdens of ownership, consumption and “keeping up with the Jones’s” – then you will understand. The first time out with the bike loaded to the gunnels was interesting. I set off in a rather wobbly fashion, but soon found my balance and things smoothed out. I think I’ll need to work out a more balanced packing system, but that is for another day. The bike handled the weight really well, and I found that an extra 30-40kg of stuff did not slow me down that much (hooray!) at least not on the flat…. hills will be a different matter me thinks. An important lesson in road safety was also learnt yesterday: hand-signals have no place in China. In fact, I think they encourage the exact opposite behaviour to what I am used to in Australia. I was approaching a left turn on a relatively busy stretch of road down near the lake. I dutifully stuck my left arm out in my best and clearest signal that I would be taking the next turn. I dropped my arm and was beginning to execute the turn when I was overtaken on the left by a chap on motorcycle. A little wobble, some corrective action, useless complaining in English, and sharp braking meant that I didn’t collide with him or anything else, but I well and truly missed the turn-off. Bearing in mind that the use of indicators and other signals westerners consider to be standard practice are completely absent in this country, perhaps he thought I was stretching my arm for fun? Or did he assume I was telling him it was safe to overtake me?? Either way, hand-signals don’t work here. Good to know. The originally rock-hard leather saddle that I purchased for the adventure is beginning to shape to my bottom reasonably well, but we still have a ways to go. After each long training ride I can still feel those pressure points for a day or so afterwards and it’s not a comforting thought only five weeks out from the start. “They” say it takes between one and two thousand kilometers in the saddle to get them truly worn in, but I’m starting to wonder exactly how pathetically soft my derriere is. Perseverance, ice and panadol should get me through (fingers crossed). The next few weeks are going to be really busy. I leave Dali on July 20 to head to Hong Kong for a new tourist visa to cover the time required to cycle from Beijing to the Laos border. After a week in Hong Kong, I’ll fly up to Beijing and have a week to see some of the sights and get ready for the journey. Then it’s time to hit the road and head for Melbourne. Fundraising: I can now accept donations! If you would like to donate a dollar or ten towards my goal of raising $50,000 for melanoma research, that would be great. There is a link from the donation page on my website to the Cancer Council portal where you can make a donation using credit card. Remember, all the money raised will go to the Cancer Council as I am paying for everything for the trip out of my own pocket, so dig deep! Read all your entries, looking forward to when the trip starts. Remember to post plenty of photos.